In King County, the new Highway 99 became Aurora Avenue North. Traffic climbed, new businesses came into existence, while older businesses evolved. What had once been fuel and feed stores became nurseries and drugstores. Restaurants catered to the ever-increasing number of residents and visitors. 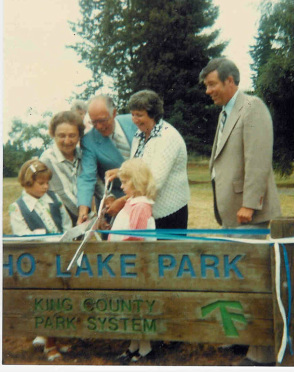 Shoreline School District was formed in 1944, and soon the Echo Lake area had a new identity as a part of something larger and cohesive. 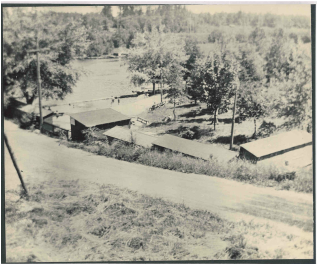 During the 1950's, Echo Lake became one of THE places to go! Folks from the Big City of Seattle would drive out into the country, to take advantage of the rural pleasures of Echo Lake. Certified swimming lessons from the Edmonds School District were held at Echo Lake Bathing Beach in the summers of the late 1950s and 1960s, and school bus loads of kids plunged into the waters. The Butzke family still ran the bathing beach, and made sure rules were followed (such as how far children must be able to swim, unassisted, before they were allowed to go out to the diving raft). The photograph above shows students lining up for Red Cross swimming lessons at the beach, ca 1964. They would pay admission, change their clothes, and dive into the lake! The buildings in the distance may be imports from the Seattle World's Fair in 1962; when the fair closed, many of the structures were sold. 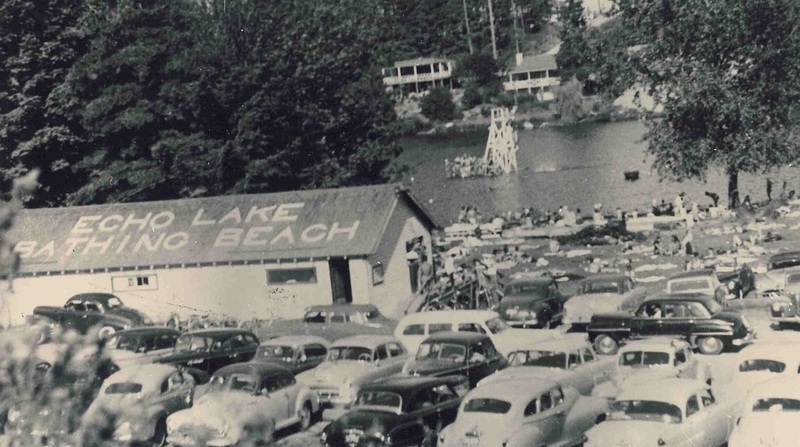 Circa 1955, Echo Lake Bathing Beach. There are dressing rooms, boat rental, admission stand, and many concession stands. The diving platform is a popular swimmers destination. 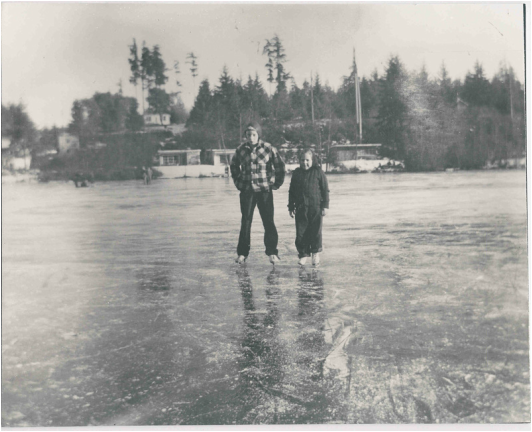 Brother and sister Jarvis and Pat Erickson, children of the Butzke pioneers, learn to skate on Echo Lake. 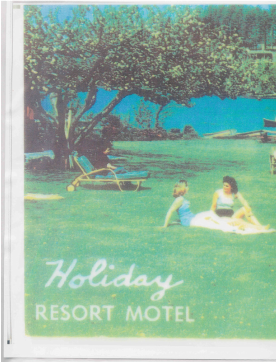 LEFT: Operating in the 1950's, the Holiday Resort (located at @192nd Street) sprang up from the post-WW-II vacation movement of the population. Primarily, it provided a swimming area and trailer accommodations. Eventually it became a static trailer park. <. . . . . . . . . . . . . . .
At the north end of Echo Lake, a new Echo Lake Park is dedicated. From left to right, Kim Scott and grandmother Florence Butzke Erickson help Tracy Owen and Barbara Monks cut the ribbon.